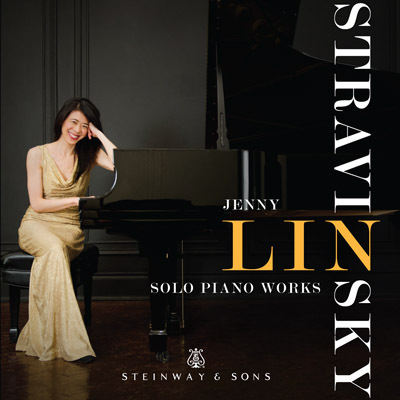 What a refreshing listen: I’m getting quickly addicted to the Taiwan-born pianist Jenny Lin’s new release, which is the latest to come out on Arkiv Music’s Steinway & Sons label. It’s devoted to Stravinsky’s music for solo piano — along with a delightful mini-Firebird suite of three movements arranged by Guido Agosti for keyboard. Yes, over the past year my ears have been oversated and oversaturated with Stravinsky’s orchestral music, especially the three big Russian ballets. But Lin has put together a nifty program that brings a fresh focus to the Russian’s musical thinking and evolution. Lin’s crisply incisive attacks and sheer sense of fun are all part of a style shaped by musical intelligence and determination. And her playing shines light on Stravinsky’s concept of counterpoint as well as the ingenuity of his rhythmic inventions. My knowledge of jazz was derived exclusively from copies of sheet music, and as I had never actually heard any of the music performed, I borrowed its rhythmic style not as played, but as written. [so much for oral versus literary tradition.] I could imagine jazz sound, however, or so I like to think. Jazz meant, in any case, a wholly new sound in my music, and ‘L’Histoire’ marks my final break with the Russian orchestral school in which I had been fostered.